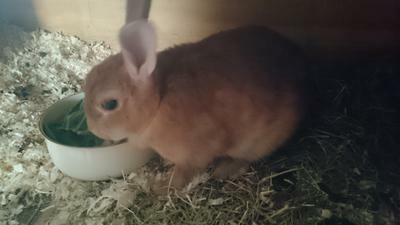 Not sure if rescued bunny is pregnant?! Long story short I have rescued 2 bunnies from a friend who found them wandering around their garden. They were found 2 days apart from each other. One is an un neutered male and the other is female. I have now separated them but I feel like the female may be pregnant. Her stomach is quite big and hangs low near her rear end she always lays on her side and not upright she hasn't started nest building or pulling her fur out (yet) but she does eat a lot and drinks alot and sometimes makes these weird noises when lying down. I've felt her stomach carefully and haven't felt any movement or anything yet but her stomach does seem a lot bigger than it should be as she is quite small and looks young. Do these sound like symptoms and is there anything else I should look out for? I'll attach some pictures.